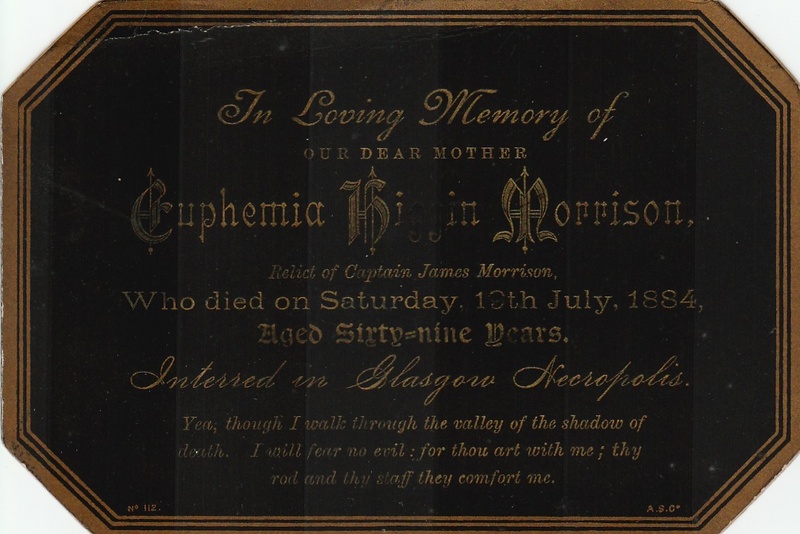 Euphemia Bell Higgin, daughter of William Higgin and Grizle Maxton was christened on 18th September 1814 in the parish of Larbert, Stirlingshire. She came from a family of at least five children, all christened in Larbert and living at Carronshore in the parish. She married a local Larbert man, James Morrison, on 11th June 1839 in Barony, Lanarkshire. 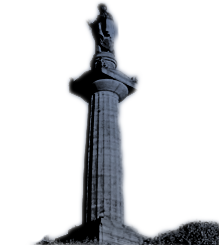 He was a son of John Morrison and Ann Welch christened at Larbert on 28th May 1813. James is described in the census records as a river pilot and the couple lived just south of the river Clyde between 1841 and 1871 close to James’s place of work. In the Merchant Navy Seamen Records for 1835 James Morrison of Carron [Larbert] is recorded as a mariner on the Gentoo of Greenock and in 1845 a James Morrison of Grangemouth is recorded but no ship is named. Gentoo was a wooden sailing ship, newly built in 1832 and from newspaper references it seems she traded to India and North America. As James is not at home when the1841 census was taken it may be that he only became a pilot after that date so that he did not have to be away from home on long voyages. It would be possible to find out more about James Morrison’s career as a river pilot at Glasgow City Archives which holds an indexed record of licensed pilots, 1826-2003 (ref: T-CN35/5/1-2). Euphemia and James had two daughters Grace (13th June 1840-1917) and Annie (3rd March 1842-1933). Grace married David Arthur in 1862 and Annie married John Black in 1867. Several Arthur and Black grandchildren who died young were also buried in the Necropolis in the following years and Euphemia followed in 1884. In the 1881 census Euphemia had returned to Larbert and was living with her daughter Annie Black and several grandchildren and that is where she probably died, on 19th July 1884. Annie and her husband are not buried in the Necropolis but Grace and her husband and two adult daughters are so that family presumably remained living in Glasgow.